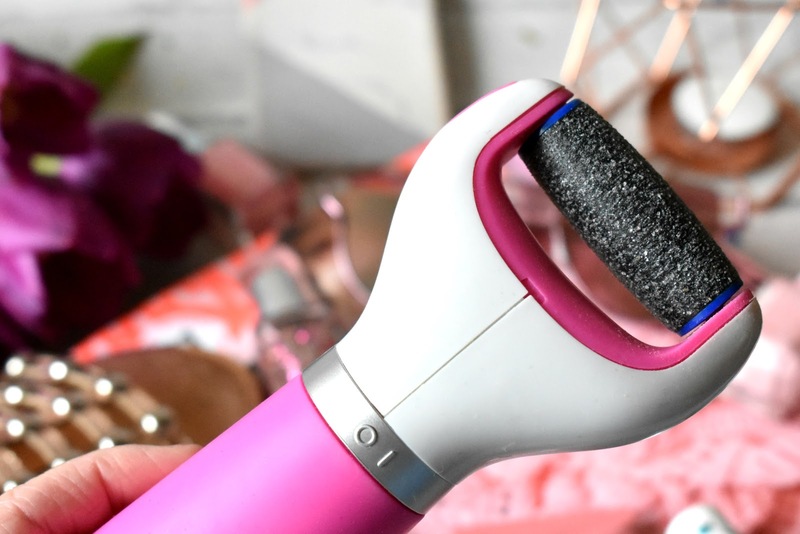 HaySparkle: Getting Your Feet Spring & Summer Ready! It's finally Spring which hopefully means warm and sunny days are on the way, well I'm keeping my fingers and toes firmly crossed anyway as it's currently raining cats and dogs out there as I type this, anywho moving on......Now seems the right time to get pampering those tootsies and get them looking their best ready for the pretty sandals to come back out, oh how I'm longing for the days I can whack on some flip flips without even thinking and walk out the door, c'mon sun! The first essential for me to get my feet looking half decent is getting rid of any dry, hard skin and my Scholl Express Pedi does this in a matter of seconds, I actually got mine for Christmas last year and I cant believe I didn't buy myself one before hand, it buffs and smooths out the skin on my feet so quickly and the results really last. It's pain free too which surprised me as I thought it would hurt and I find it somewhat relaxing if I'm honest he he. 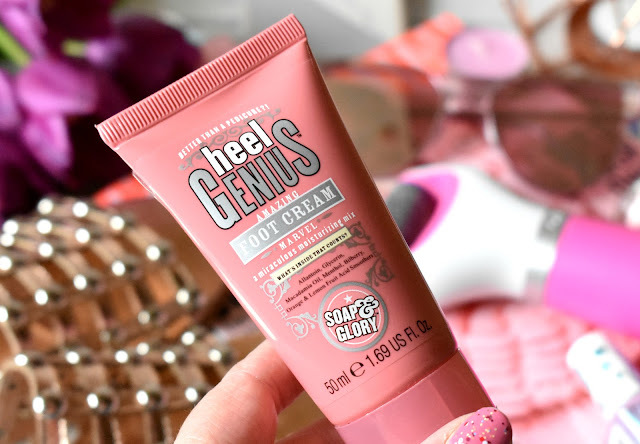 After the gross dead skin is gone I love to nourish my feet with my favourite foot moisturiser - Soap and Glory's Heel Genius! 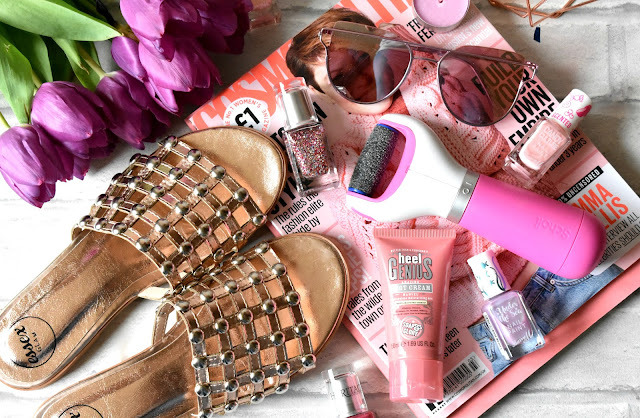 I've been using this stuff for years because it actually works and lots of other foot creams I've tried before talk the talk but definitely do not walk the walk like Soap and Glory's Heel Genius! It keeps my feet extremely soft, smooth and moisturised and you can even use it as an overnight treatment if you apply a thick layer to your feet before bed and sleep in some cotton socks, it works a treat I tell ya! Finally after giving yourself a cheeky pedicure your going to need some pretty sandals to wear and the latest addition to my sandal collection are these gorgeous Casey Bronze Metallic Studded Slip On Sandal Sliders* by XY London. These pretties are so comfy and easy to just slip on and they go with literally anything whether it be mini dresses, shorts, skinny jeans, maxi dresses, you name it they work. I also love the colour of these, the bronze effect sometimes looks gold, rose gold or even copper depending on the lighting, I always tend to go for bronze/gold sandals in the Spring/Summer as I find them so versatile so much nicer than wearing Black! You can find the Casey Bronze Metallic Studded Slip On Sandal Sliders for £19.99 HERE, they are also available in Black, White and Silver! I agree with you about Heel Genius - it's the only foot cream that's worked for me!